Samsung has announced the Galaxy A80, a new midrange phone with a camera that not only slides up from the rear of the device, but also automatically rotates so it can function as both a selfie camera and a rear-mounted camera. That novel camera allows this to be the first phone to feature Samsung’s “New Infinity” display, which it announced last year. The A80’s automated pop-up mechanism contains a triple-camera array consisting of a main 48-megapixel f/2.0 camera, flanked by an ultrawide 8-megapixel f/2.2 camera, and a third ToF (time-of-flight) sensor. The sliding camera mechanism means there’s no sight of a notch or a hole-punch in the phone’s 6.7-inch FHD+ (1080 x 2400) Super AMOLED display. We’ve seen swiveling cameras and slider mechanisms used in smartphones before, but never together like this. Oppo’s 2014 N1 smartphone had a rotating 13-megapixel camera, although both orientations produced similarly underwhelming photos. Pop-up cameras have also appeared on a number of notchless devices over the past year, including the Vivo Nex and Oppo Find X. More recently, slider phones have also made a comeback on devices like the Honor Magic 2 and Xiaomi Mi Mix 3. The Samsung Galaxy A80 is available in gold, white, and black. Along with its camera setup, the Galaxy A80 also includes a 3,700mAh battery that supports fast charging at 25W. It also has 8GB of RAM, 128GB of onboard storage, and it includes an in-display fingerprint scanner. The phone is available in three colors: gold, white, and black. Along with the Galaxy A80, Samsung also announced an April 26th release date for the Galaxy A70, which it first announced last month. The A70 has a teardrop-notched 6.7-inch display with a 20:9 aspect ratio, and it also includes an in-display fingerprint scanner. It has a triple-camera array on its rear featuring a main 32-megapixel sensor along with a 5-megapixel depth sensor and an ultrawide 8-megapixel sensor. 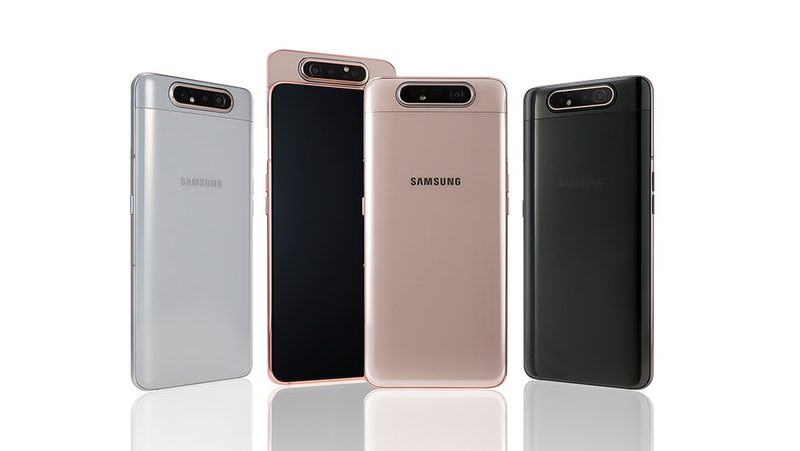 The Galaxy A70 will be available in four colors: coral, blue, black, and white. The Galaxy A80 will launch on May 29th, joining the Galaxy A10, A20, A30, and A50, which have all been announced in recent months. Pricing for the Galaxy A80 and A70 is yet to be announced.